For today's guest post, I'm pleased to introduce you to my dear friend Devon Fox. Of course, if you read my blog regularly, you are well acquainted with Devon already. Devon was one of the first people I met when I moved to San Francisco, and we were immediately joined at the hip and have been ever since. You might remember Devon from Apple Hill, Gary Danko or our Gluten Free Spaghetti and Meatballs post we did a couple of months back. As I explained then, she was diagnosed with Celiac Disease shortly after we met. This means she can't have gluten. Like, at all. She decided to make gluten free udon noodles from scratch. I love that she used a plastic bag to squeeze out the noodles. It makes me feel like I could totally make this on my own. Thanks again Devon! I’m obsessed with Jaymee’s blog. Almost as much as Jaymee is which makes being friends very easy for us. As Jaymee mentioned, I also have celiac’s disease, so a lot of times I can’t eat the amazing things she cooks up. (I'm making the mini deep dish pizzas this weekend for our Daytona party and will shed a little tear when I can’t eat one!) So for this post and my one next week (get ready, it’s going to be amazeballs) you will be getting gluten free, but so good that even people who can eat gluten will be excited! If you have a double boiler, that is easiest. If not, find a pot that another pot or metal bowl can sit on top of. Add about 2 cups of water to the pot and boil. In the double boiler (or metal bowl) mix the rice flour with 1 3/4 cup water, 1/4 teaspoon salt and 1 teaspoon sesame oil. So this next step you can do a few different ways. The recipe I read on the web said to use a cookie press. But try finding a cookie press! Bed, Bath and Beyond was out of stock, Macy’s and Williams-Sonoma don’t carry them, and the one at Sur La Table didn’t have the right shape for noodles. I thought about using my pasta attachment for the Kitchen Aid, but the Udon noodle dough is really sticky and I was scared at what it do to my pasta maker. So…I grabbed a zip lock and poked to holes in it and…it worked! Once you get all the sticky dough in the plastic bag, you are ready to “cook” the noodles but FIRST… get a bowl of cold water ready and set aside. Also put a colander in the sink and have your sesame oil nearby. Hold the bag over a the boiling salted oil water and SQUEEZE! I giggled the entire time. First the bag looks like a very full cow udder when you first start, and it just was so funny to me as it came out and plopped into the water. Anyway...Once the noodles are done they will float to the top. You can use a strainer to scoop the noodles out and immediately submerge them in the cold water. (this will stop them from cooking). Then scoop them out of the cold water and put them in a colander to rinse them off. Pour a little oil over them so that they don’t stick to each other and set aside. There are many things you can do with Udon noodles. Make a cold noodle salad, use in a variety of curry dishes, and my personal favorite…Asian noodle soup. The thing I like best about this type of soup is you can put whatever you want in it! For this one I went with noodles, shrimp, green onions, mushroom and garlic and a poached egg. But you can use chicken, pork, tofu, anything! Thin slice 2 green onions, and mince 1 clove of garlic. Add to chicken broth and let simmer. You can cut the bok choy in slices but I like to make ribbon slices (top to bottom) and set these aside to add at the very end. You can add sriracha or red pepper flakes to reach your level of hotness! Fresh jalapeños are good too and so are fresh basil leaves! Boil about 2 cups of water in a 4-quart pot. In a double boiler or a bowl or pot that fits into the 4-quart pot, mix the rice flour with1 3/4 cup water, 1/4 teaspoon salt and 1 teaspoon sesame oil. Once mixed together, place the double boiler (or bowl or pot) onto the pot with the boiling water. Stir for about 3 minutes until mixture has thickened. Remove from heat and fill the pot with boiling water about 3/4 full. (You will use this for cooking the noodles). Salt and add a bit of oil to the water, let it return to a boil. Take a plastic bag and poke small holes in to the bottom. Load all of the "sticky" pasta dough into the plastic bag. Once the water has returned to a rapid boil... hold the plastic bag over the pot and SQUEEZE! The "noodles" will drop into the boiling water. When the noodles rise to the top, use a strainer to left them out and immediately submerge in cold water. Once they have cooled, rinse them in a colander and toss with a little more sesame oil so that they don't stick together. Use in whatever recipe you choose! (See below for soup idea). Bring the chicken broth to a simmer in a medium sauce pan. 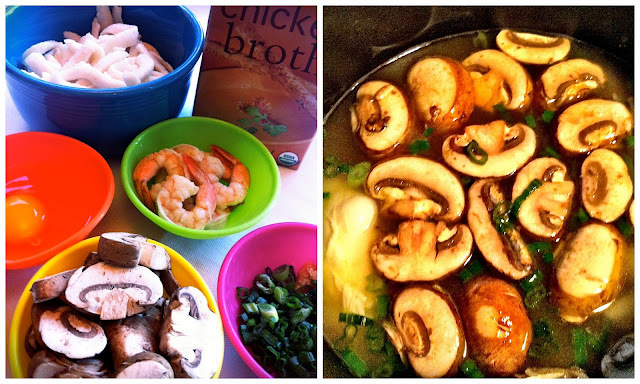 (The broth should be about 2 inches deep in the pan.) Add the garlic and onions and let simmer. 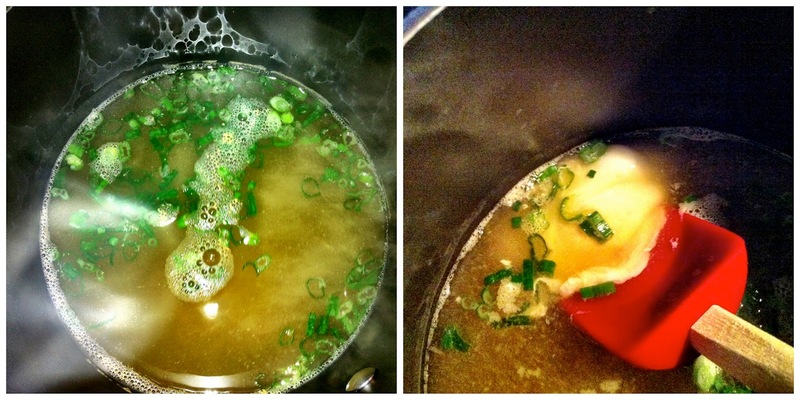 Crack the eggs into separate measuring cups and slip them one at a time into the broth. Cook for two minutes. Add the noodles and bok choy, mushrooms and shrimp and stir very gently so as not to break the eggs. Off the heat, gently stir in the Bragg’s. Taste and add more Bragg’s if necessary. Divide the soup between two bowls and eat immediately. Yay for this page. I've very recently realised I've become gluten sensitive, and unfortunately, given that my mainstay (sandwiches) is now out of the question, because gluten-free shop bread is disgusting, I've actually lost a fairly large amount of weight, due to my food intake dropping through the floor. So, in checking what noodles were made with what rice, I found this. 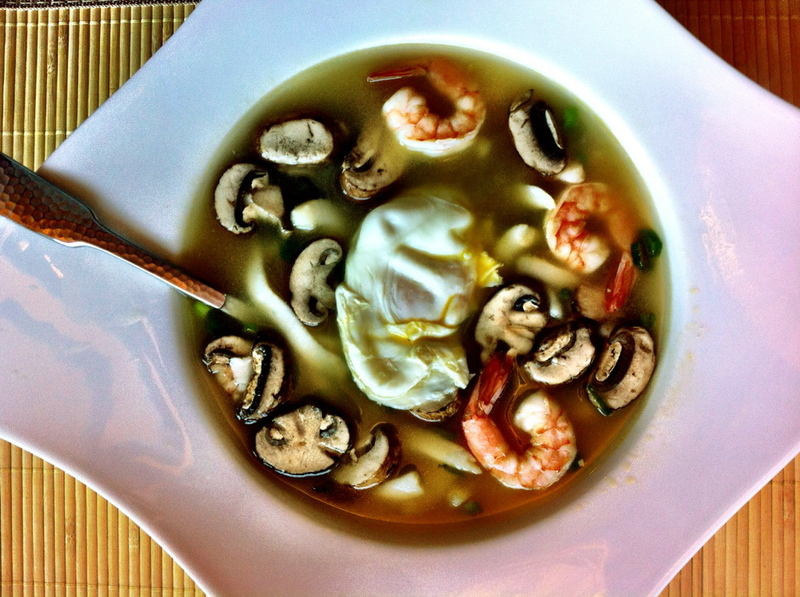 Awesome, Noodlesoup with poached eggs is one of my favourite things to eat, and it's within my ability to cook, whether or not the Udon will be, I guess we'll just have to see! I love udon noodles , definitely going to try. Since you mention cookie press, I thought I'd let you know that there is an (South) Indian rice noodle dish called Sevai made from fresh rice noodles. We use a special press( search Murrukku Press) which does the job well. How long did you cook your noodles for? I've tried making them a few times now with mixed results. They're either undercooked or mushy and falling apart. They always appear to be floating on the top due to the water boiling. I'm sensitive to tapioca starch, do you know if arrowroot or potato starch can be subbed? Not sure but if you try it let me know how it turns out! !